Who does not like to go on a shopping spree/? Many of us keep saving all the dollars, pounds and pence to shop at the end and beginning of the month that includes all the grocery items, to the clothes and footwear. These days, fashion and trends are highly followed, people are running big and small export quality fabrics/clothes to meet the living standards and demands of the costumers. We like wearing luxury clothes, some branded shirts and pants, some awesome celebrity/ designer purses & all such extravagant accessories to look cooler. Advancement is taking this world to some other level. We are working hard for a better lifestyle so no matter what we always keep a check that which brand is opening up in the whereabouts, which one is closed down or shifted to some other area, which company is doing good or which brand offers good quality and excellence. We should always cut the coat according to the cloth, if not then at the end it will be a miserable living if we are spendthrift and do not save money for the rainy weather. Well there is a wide range of men/women garments’ companies and brands who offer good quality fabric/merchandise so people would develop a good level of trust in them and they will benefit the masses from kids to the adults and elderly people. 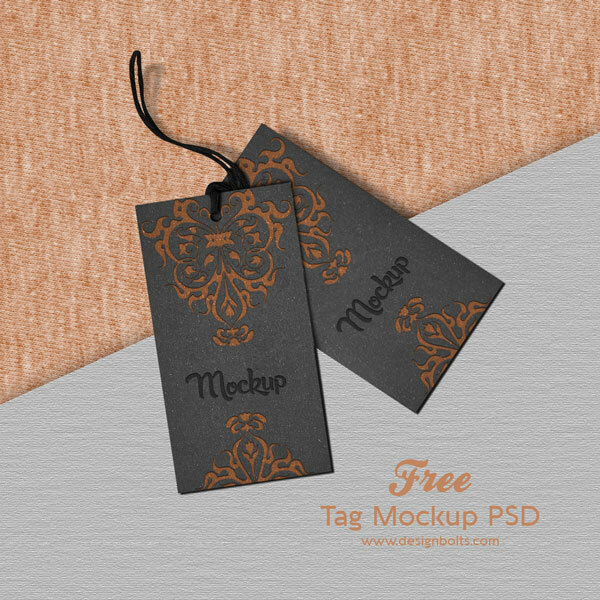 Here I am proving you a post of free brand tag mockup psd which can be used in your projects of brand tags, you can place your own design into this mockup and it is ready to be showcased before your client that how his logo or milestone of the brand will look in the real form. Brand tags are little cards, tags enclosed to the garments/shirts, jeans and pants etc., to let people know they are originally manufactured by the respective brand, and then there is no room of doubt for being not genuine or for being fake. It is basically a company or brand’s trademark that they pursue throughout their business calling. Stick around for more interesting design posts in coming days, a lot more is already lined up and is ready to benefit you by all means, subscribe us for more design and art posts. Here we go!